Evidence on the association between physical activity and risk of hepatobiliary cancers is inconclusive. We examined this association in the European Prospective Investigation into Cancer and Nutrition cohort (EPIC). We identified 275 hepatocellular carcinoma (HCC) cases, 93 intrahepatic bile duct cancers (IHBC), and 164 non-gallbladder extrahepatic bile duct cancers (NGBC) among 467,336 EPIC participants (median follow-up 14.9 years). We estimated cause-specific hazard ratios (HRs) for total physical activity and vigorous physical activity, performed mediation analysis, and secondary analyses to assess robustness to confounding (e.g., due to hepatitis virus infection). In the EPIC cohort, the multivariable-adjusted HR of HCC was 0.55 (95% confidence intervals (CI) 0.38-0.80) comparing active and inactive individuals. Regarding vigorous physical activity, for those reporting >2 hours/week compared to those with no vigorous activity, the HR for HCC was 0.50 (0.33-0.76). Estimates were similar in sensitivity analyses for confounding. Total and vigorous physical activity were unrelated to IHBC and NGBC. In mediation analysis, waist circumference explained about 40% and body mass index 30% of the overall association of total physical activity and HCC. Findings suggest an inverse association between physical activity and risk of HCC, which is potentially mediated by obesity. 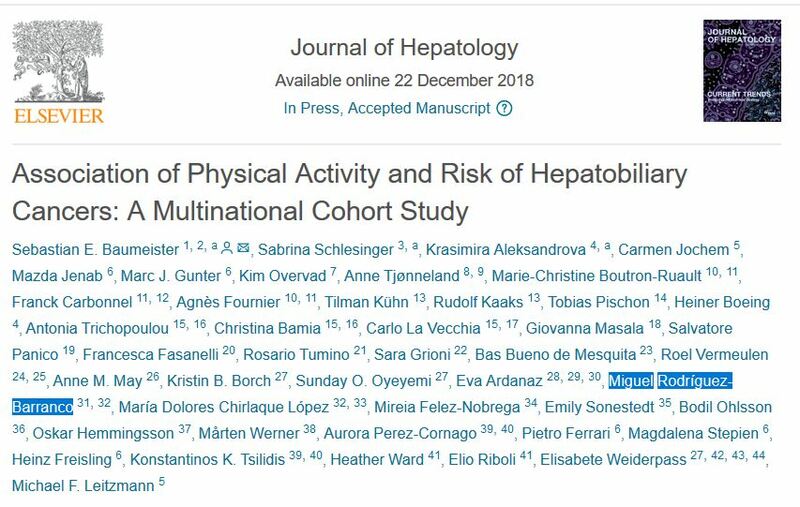 In a pan-European study of 467,336 men and women, we found that physical activity is associated with a reduced risk of developing liver cancers over the next decade. This risk was independent of other liver cancer risk factors, and did not vary by age, gender, smoking status, body weight, and alcohol consumption.